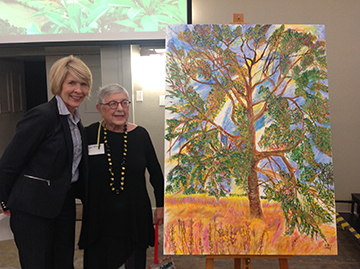 Pictured, from left, Associate Lonnie Pederson, featured brunch speaker, and Associate Joni Altringer, artist, with picture of oak tree painted especially for speaker to use in presentations. 33rd annual Presentation Prayer Center Brunch, Fargo, was held October 4. Associate Lonnie Pederson presented on “Leadership and Spirituality: Life, Livelihood and the Spirit.” The acorn, which is a symbol of the Presentation Sisters, represents the great power of the seed of spiritual practice and which ultimately becoming the mighty oak. Creator of life and Sustainer of seed and soil, of tree and flower, you have created this world and all that lives in it. It is to you that we come in this prayer of dedication and blessing, for you are the giver of life and the sustainer of all that lives. We come to you to dedicate this tree in memory of Nano Nagle who you continue to hold in your generous grace. May this tree remind us of this woman who is held forever in your never-ending love. May this tree dig deep roots and grow wide branches to bear witness to your abundant love and grace made known in our sister. We ask for your blessing upon this tree and upon us, that life might dwell and bear witness to the resurrection of our Lord Jesus Christ, through whom we pray. Amen.